It’s getting close to Christmas now, and it’s about this sort of time that I start to panic about stupid things like deciding which type of stuffing to make. I’ll spend an hour or so scattering cookbooks around the dining room, looking for something new and different to cook on the stuffing front. There’ll be another hour spent searching the almighty Internet for the same thing. Eventually, there’ll be one book left on the table. It’ll be open at the page with the American turkey stuffing recipe, and I’ll succumb to the inevitable and start to cook it. Delia’s recipe is very easy. All you need is a frying pan to brown some of the ingredients and a big bowl for mashing everything together. Start with the prep – chop 225g of onions and four sticks of celery – keep the onion fine and the celery chunky – and start to brown them in a frying pan in some butter. Add 450g of the best pork sausages or sausage meat you can get to the pan, and start to brown that, too. If you’re using sausages, skin them and chop the meat into big pieces, and if you’re using sausage meat, roll three quarter inch balls and drop them into the pan. You’re aiming for a nice, crunchy edge on some of the vegetables and meat, but you don’t need to cook anything right the way through. Ten minutes should do it. 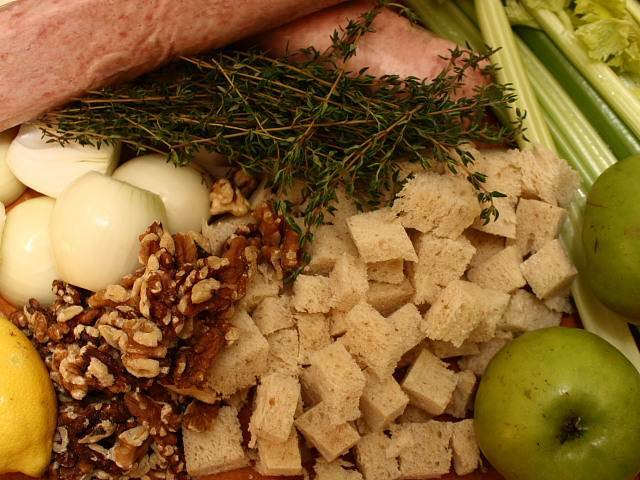 Put the veg and meat into a large mixing bowl and add 225g of cored, peeled and chopped Bramley apples, 110g of chopped walnuts, a dessertspoon of fresh thyme leaves, the grated zest of a lemon, half a teaspoon of ground mace, a beaten egg and 175g of cubed white bread, with the crusts removed. Season everything very well with salt and pepper. Get really stuck in and mix everything together very well. Fry a small piece of the stuffing and taste it to check the seasoning, and when you’re happy, pack the stuffing into a fairly shallow oven proof dish ready for cooking. I normally cook this for about an hour in the same oven as the turkey, covered with foil for about half of the time. It’s very forgiving, so don’t worry too much about over cooking it. It’s the 22nd of December today, so I don’t have any photos of the finished product – it won’t be cooked until Christmas Day, obviously. For this one, an ingredients only type shot will have to do. Just the ingredients look bloody delicious! This is my go to stuffing every year! It is delicious and if there is any left over it is an added bonus to cold meats!! !